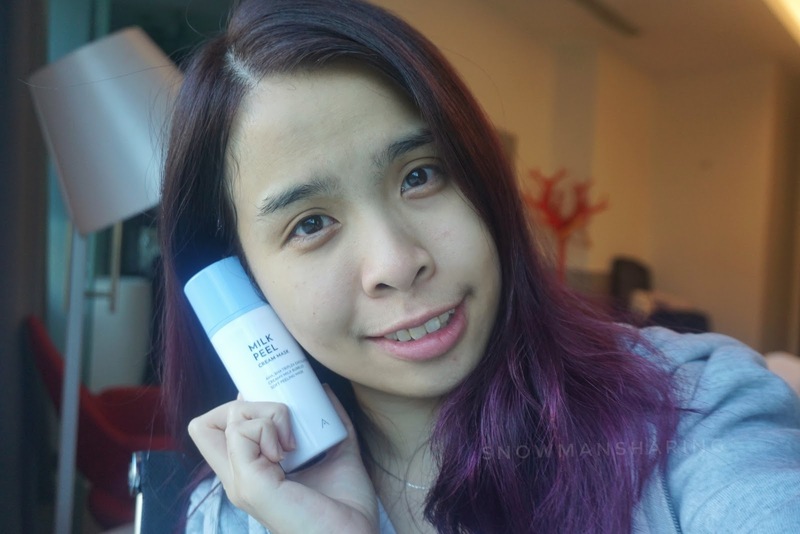 Here to share another beauty product I use from ALTHEA!! Besides some of the skincare that I use daily, like toner, moisturizer, and sunscreen. My weekly routine for my skin is detox and clean my pores using a mask. There are so many different kinds of masks that I have to give it a try, and despite being always so busy on schedule I prefer using peel off masks or even face mask that is quick and absorbs to my skin. 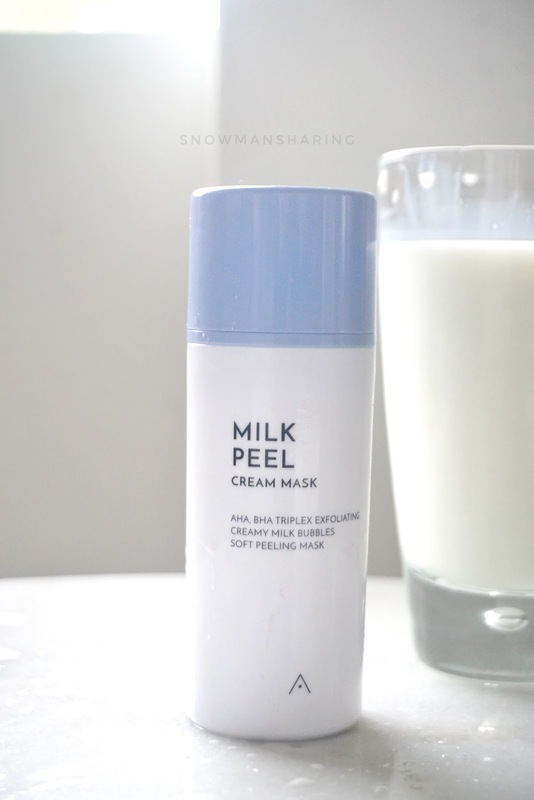 This Milk Peel Cream Mask is super gentle on skin and easy to use!! 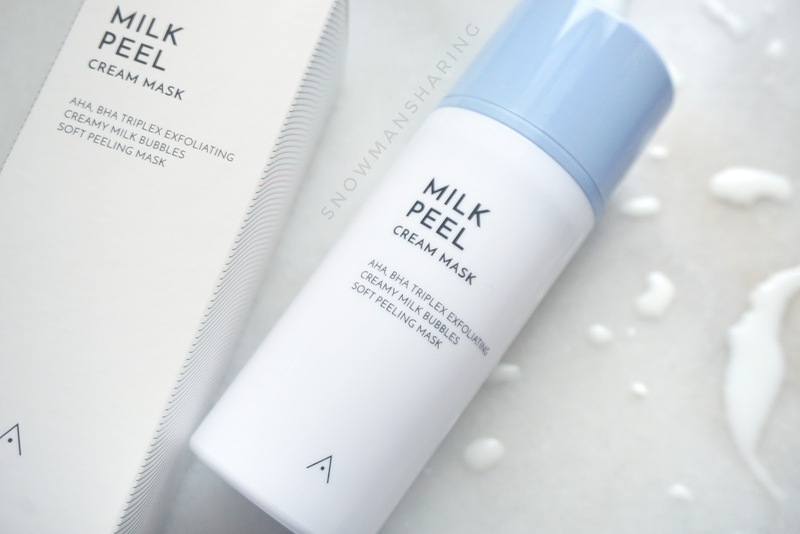 You can use it as a daily milk peel cream mask, where you just wait for it to bubble up and wash your face after a few minutes. Leaving your skin a super refreshing complexion! 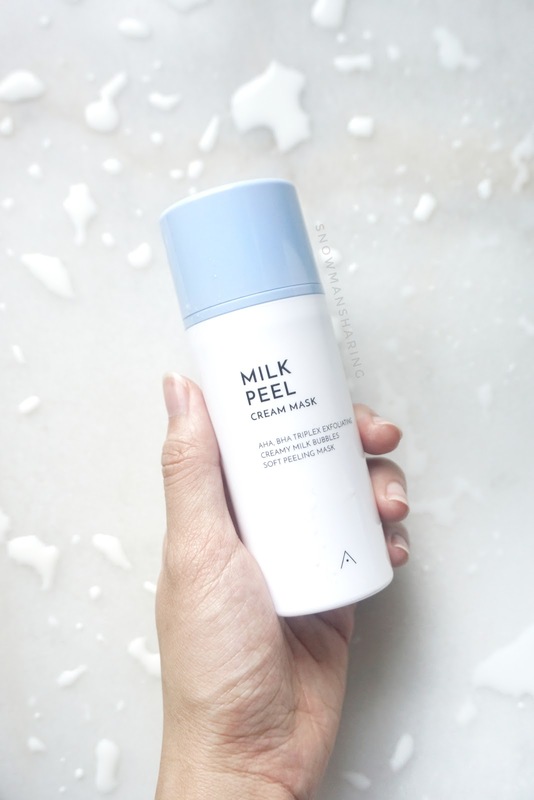 This product is suitable for combination skin types, those who suffered large pores, have rough sensitive skin that needs gentle exfoliation and likes me dry skin that needs to stay moisturized even after peeling! All of their main ingredients works wonderfully for our skin, AHA effectively removes any dead skin cells on the surface of our skin. BHA that removes any impurities and declogs our pores. 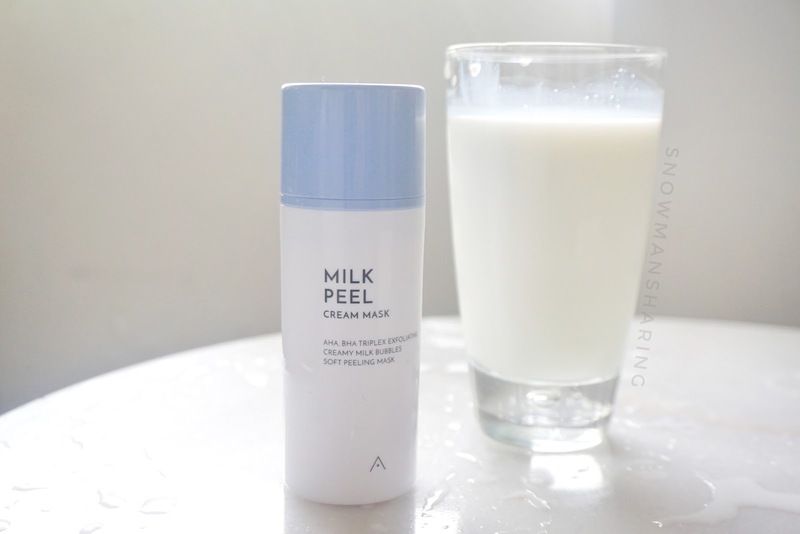 Where milk helps moistures and refreshes our skin after exfoliating process!! 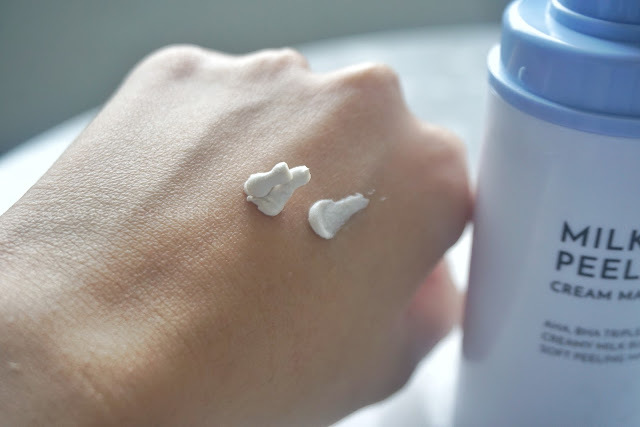 I like how we have these three important ingredients for our skin, it has these super creamy milky texture and gentle formula that gives us super smooth baby skin too. Click here to know more about the differences between AHA and BHA. I love this packaging that is super convenient and easy to use. With the pump usage, is much easier for you to control the usage. The color of the entire packaging is really cute too, pastel blue and white. AHA / BHA work a Double exfoliating effect that smoothing out roughness and removing impurities from the pores. It works like magic and so gentle to skin but it works great as daily dead skin cell care. It removes external impurities in our pores and skin surface. After our skin and pores are clean, make sure that our skin also constantly need to stay hydrated too. 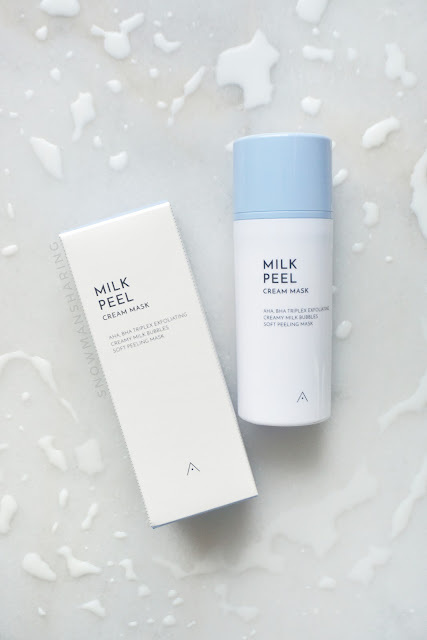 Milk Peel Cream Mask contains Casein Protein (Milk) provides the skin with hydration and keeps it moisturized. 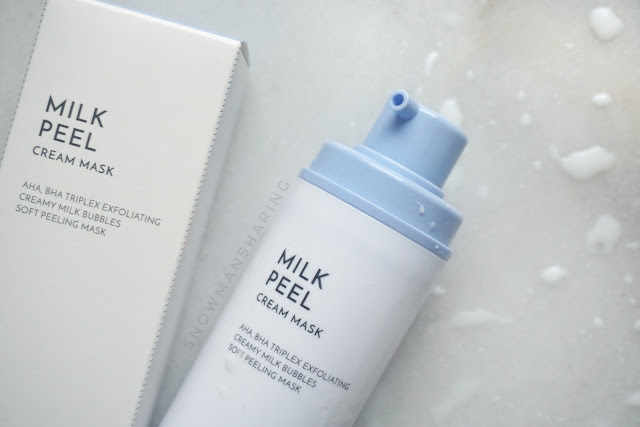 I like that this Milk Peel Cream Mask does not make my face feels dry too even though I use it every day on my skincare routine. It just leaves my skin feeling so clean and revitalized! Another part that I like that it has this super creamy clay texture that is so soft and so gentle to apply on our skin. The creamy clay texture bubbles into a rich lather to deep cleanse the pores and remove dead skin cells. Apply one thick layer on your face and feel hows the sizzling sound where it starts to bubble out and clean up your pores. 1. Pump out the amount of the Milk Peel Cream Mask that you need to use. Check how creamy the clay cream bubble when you squeeze out. 2. Apply evenly on your skin. You can apply a thick or thin layer base on your preference. 3. It foams quickly than I expected, and I enjoyed hearing the bubble foaming sizzling sound. It was a super quick and easy process! 4. Leaves it for around 30 to 60 seconds and Rinse your face with water and you are done! 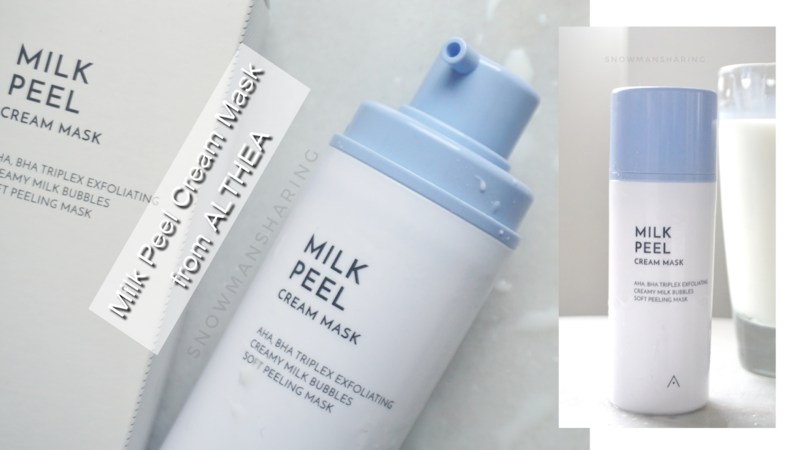 This is a quick and gentle formula daily peel mask! I love how quick and effective this product works for my skin. The bubble foaming process is quite satisfying where you can feel your face like doing massages with the bubble foam. 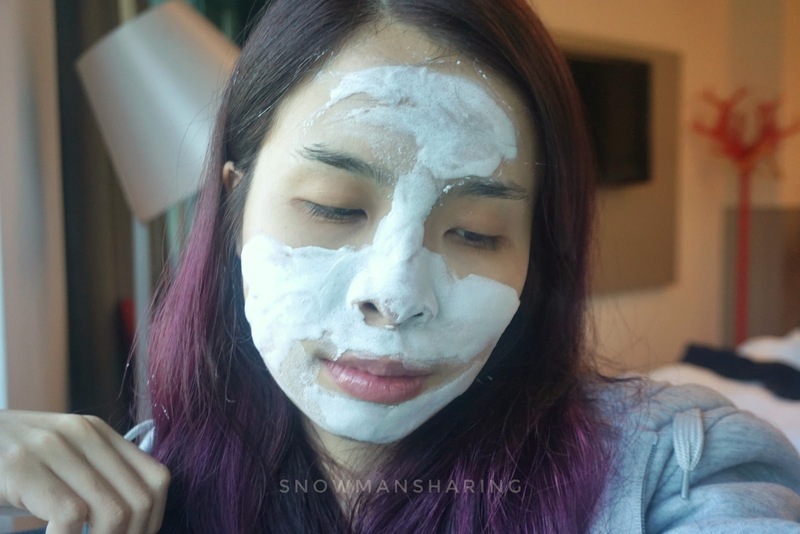 It also perfect for people who are lazy to do a facial mask or face detox with a detox clay mask. Because it can be good as exfoliating and also provide milky soft skin after use too. How could I not love this product! !